10 June/July 2018 unmanned systems inside lowest f light) and 365 feet (the height determined "public easement"). This f loor on federal airspace wasn't an issue until drones came along and raised all sorts of questions. Unlike the manned aircraft the current aviation rules are designed for, drones are dif- ferent because they're usable by even untrained pilots and can take off or land just about anywhere. What was just a hobby until the 21st century could become the way you get your packages delivered, your cell phone coverage or even have your insurance claims adju- dicated. All we need to do is figure out how local and federal laws can work to- gether to enable these markets. HENCE, MY FIRST PIECE OF ADVICE IS: Remember: This is all about public policy and laws. There will be a lot of shiny objects out there to distract your team—cool airspace control comput- ers, nifty radars, The Next Big Thing in drone platforms—just keep asking "How does this help us regulate drones over our jurisdiction?" Technology just enables your laws and policy. If you're not clear about what you want to regu- late (or NOT regulate) in the skies over your city, then all that tech is useless. Figuring out the best altitude for fed- eral versus local control for airspace should be job No. 1. The major reason President Trump created the IPP is because the FA A wasn't moving fast enough to create drone rules. The FAA isn't full of bad people who purposely want to slow roll drones; this is a massive issue that will take millions of man-hours to solve. The FA A already had a full-time job with the explosion in air travel we've been experiencing for the past few de- cades. Nobody offered to triple the size of the FAA to handle the tremendous workload drones created. The FAA did the best with what they had. 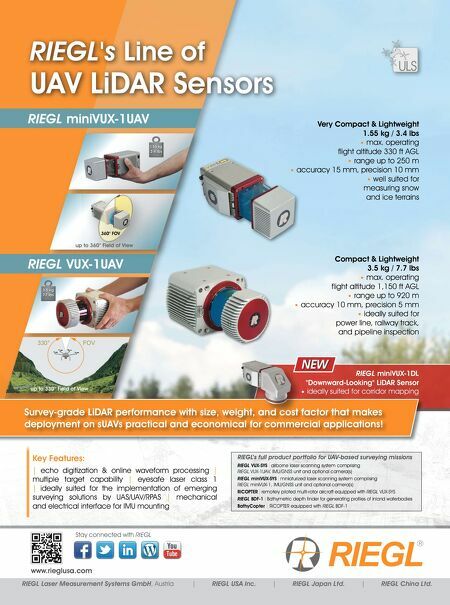 MAKE SURE YOU GENERATE ENOUGH INCOME TO OPERATE DRONES SAFELY AND EFFICIENTLY IN YOUR LOCATION. MAJOR GENERAL JAMES O. POSS (RET) is a leading expert on UAS, having targeted the first armed UAS strikes, designed the U.S. Air Force's remote split operations system for UAS control, and designed the Distributed Common Ground Station for UAS intelligence analysis. 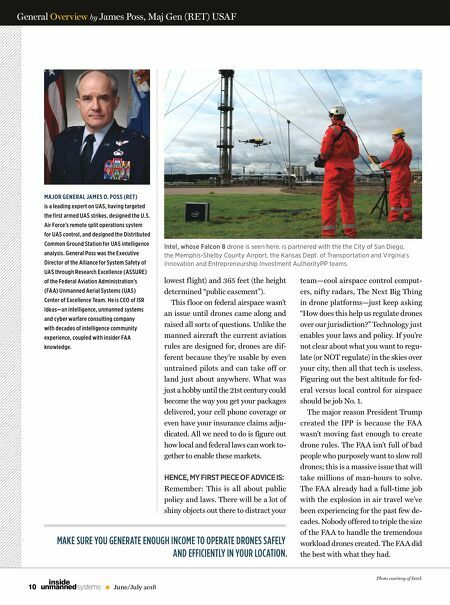 General Poss was the Executive Director of the Alliance for System Safety of UAS through Research Excellence (ASSURE) of the Federal Aviation Administration's (FAA) Unmanned Aerial Systems (UAS) Center of Excellence Team. He is CEO of ISR Ideas—an intelligence, unmanned systems and cyber warfare consulting company with decades of intelligence community experience, coupled with insider FAA knowledge. General Overview by James Poss, Maj Gen (RET) USAF Photo courtesy of Intel. Intel, whose Falcon 8 drone is seen here, is partnered with the the City of San Diego, the Memphis-Shelby County Airport, the Kansas Dept. of Transportation and Virginia's Innovation and Entrepreneurship Investment AuthorityPP teams.